While drinking plenty of water is critical to life, health and healing, simply submerging your body in water (i.e., a pool). Opens up opportunities for relief and fitness for those who otherwise may have difficulty exercising. This is especially important for aging adults and those with chronic conditions, say physical therapists and other healthcare professionals. Because of this, experts say water exercise is ideal for people dealing with issues related to strength, flexibility, balance, sore joints and pain. This includes people recovering from injury or surgery, as well as those with chronic conditions like arthritis, osteoporosis an d diabetes. The buoyancy of waist-deep water, for example, can support around half our body weight. While neck-deep water can reduce body weight by up to 90 percent. Such a reduction in weight and impact on the joints can help people who may experience difficulty standing, balancing and exercising on land to move more freely – and often with less pain. Another study published earlier in the same publication (2002) showed that combining aqua aerobics with strength training. While in the pool helped participants increase their strength by 27 percent in the quads, 40 percent in the hamstrings, and about 10 percent in the upper body. Even when people suffer from common chronic diseases like arthritis and osteoporosis. With this water exercise can help improve the use of affected joints while decreasing overall pain. 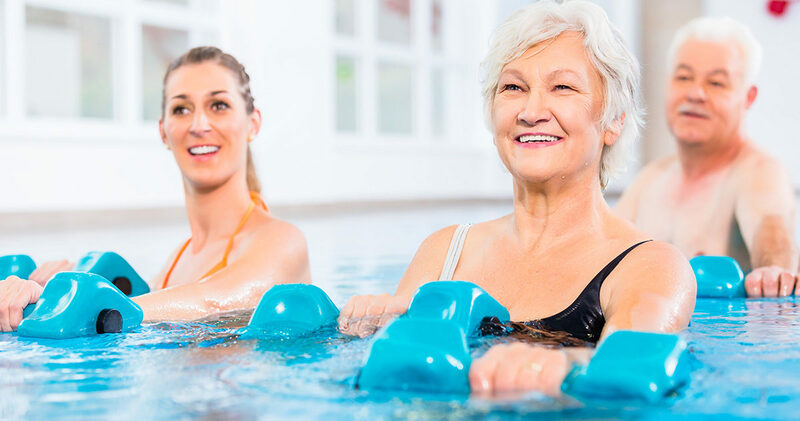 Those who feel pool exercise or aquatic therapy may help them improve fitness levels or overall functional abilities should first contact their physical therapist for professional guidance. A physical therapist can help identify your greatest weaknesses and needs. Then develop a pool fitness plan that specifically addresses these needs and your personal goals.